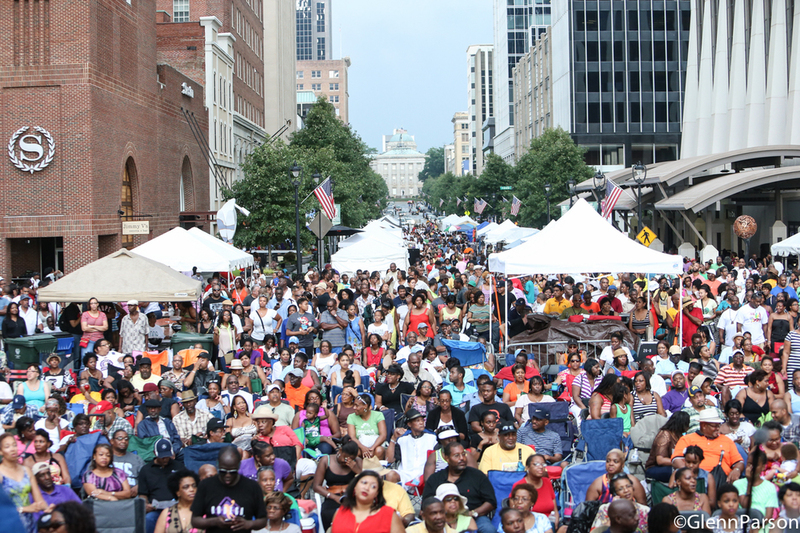 The African American Cultural Festival of Raleigh and Wake County is an annual celebration of African American culture as expressed through art, music, food and community. Over the past four Labor Day weekends, the two day festival has connected diverse people and families from across our region with local, national and international artists, performers, food vendors, area business owners, and our local media outlets. The festival has become Raleigh's premiere destination for teaching, sharing, and celebrating the distinctive folk and cultural traditions of African Americans here in North Carolina and from around the world. The African American Cultural Festival of Raleigh and Wake County's 2013 commemorative poster. Created by renowned artist Larry "Poncho" Brown. The image is entitled "Culture Keepers". The inaugural festival was held on September 4th and 5th, 2010 and exceeded everyone's expectations, with more than 15,000 in attendance. The 2013 Labor Day Festival brought more than 25,000 people downtown and featured over four dozen juried artists and vendors, a Family Village with crafts and entertainment geared toward children, and local and national musical acts on the Main Stage on City Plaza. The festival program plan was developed under the guidance of the African American Cultural Festival Governing Board, whose members were appointed by the Wake County Board of Commissioners and Raleigh City Council in August 2008. Both elected bodies charged the Governing Board with creating a major festival that would become a major tourist destination event. In May 2009, Artsplosure— the prolific organization responsible for many Triangle arts events including the annual Artsplosure Spring arts festival, and First Night Raleigh on New Year’s Eve — was contracted to provide planning, organizational, and financial expertise, among other essential service. In 2013, with the support of Artsplosure, The African American Cultural Festival has gained 501(c)(3) status and has become a nonprofit organization. Every year, the festival continues to grow and work to bring a vibrant, lively festival to the heart of downtown Raleigh. This year's festival marks the 5th Anniversary Year for The African American Cultural Festival of Raleigh and Wake County! This year's festival will be a celebration of African American culture and heritage that will exceed all expectations. Come out this Labor Day Weekend and celebrate with us!